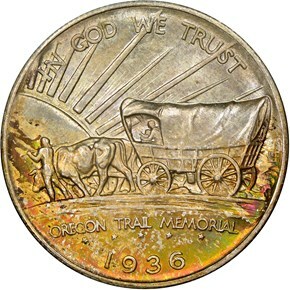 In 1926, a New York corporation calling itself the Oregon Trail Memorial Association petitioned Congress to authorize a half dollar to commemorate those who had traveled west on the trail during the mid 1800’s. Pioneer Ezra Meeker (who himself made the journey on the trail in 1851) was the president of the association and claimed he wanted to use the funds raised by the program to erect a series of monuments along the route. Congress agreed that the trail was of national significance, and authorized the coining of no more than six million coins on May 17th, 1926. The design was completed by the famed husband and wife team of James Earle and Laura Gardin Fraser. Mrs. Fraser had designed several commemorative coins, notably the 1922 Grant half dollar and dollar, and her husband, who is credited with the obverse design of the Oregon Trail half, is remembered for creating one of the most memorable of all coin designs, the Buffalo nickel. 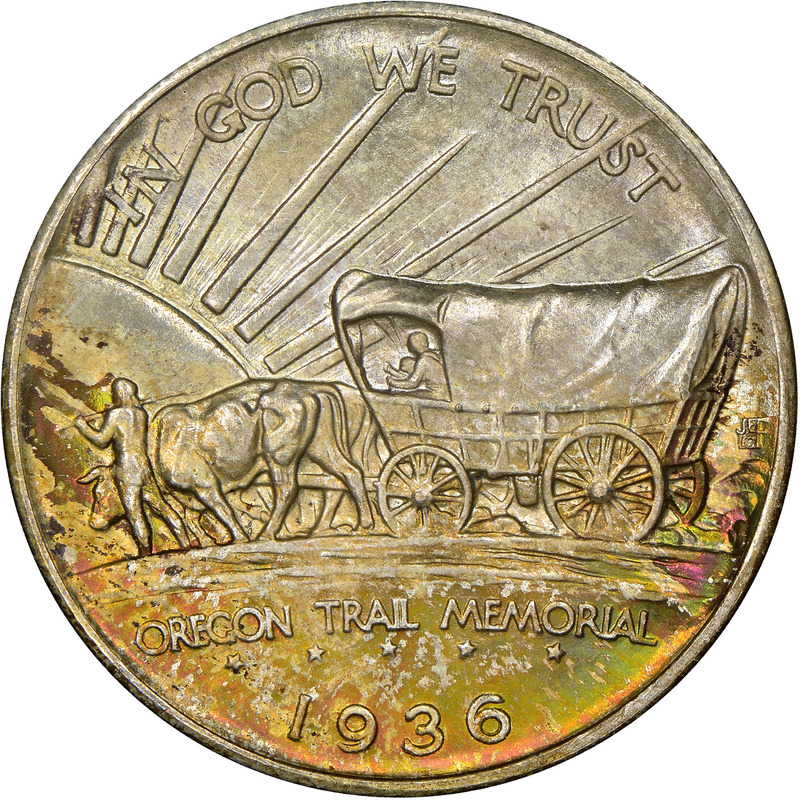 The obverse (actually considered the reverse by the Frasers and most collectors) depicts a Conestoga wagon drawn by oxen heading into a setting sun. IN GOD WE TRUST arcs above the wagon, and below are ORGEON TRAIL MEMORIAL and the date. The reverse depicts a strikingly rendered Indian with bow in hand, standing with an outstretched arm in front of a map of the country. 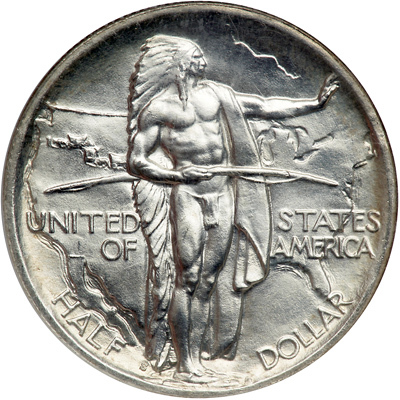 Around the Indian is the inscription UNITED STATES OF AMERICA and HALF DOLLAR is found below. The Commission of Fine Arts enthusiastically approved the design, and immediately sent the models off to the Medallic Art Company of New York for hubbing. In September of 1926, the first 48,000 coins of the design were struck. The coins originally sold for $1 each, and became an instant hit with the public. So much so that another issue was then struck in San Francisco to the tune of 100,000 pieces. Unfortunately for the Association, enthusiasm quickly waned and few of those coins sold at the issue price. The Treasury was aware of the unsold coins and ordered the Mint not to strike any more coins until all 100,000 were distributed. However, the Commission had surprising political clout and put pressure on the Treasury, which led to the minting of an additional 50,000 coins in 1928. Yet these were destined to sit in their vaults for five years. Finally, in 1933 the 17,000 remaining 1926-S coins were melted to pave the way for the release of the 1928-dated coins. Back-room politics have figured in many a decision at the Mint over the years, but the Oregon Trail commemorative program became the biggest abuser in the system. 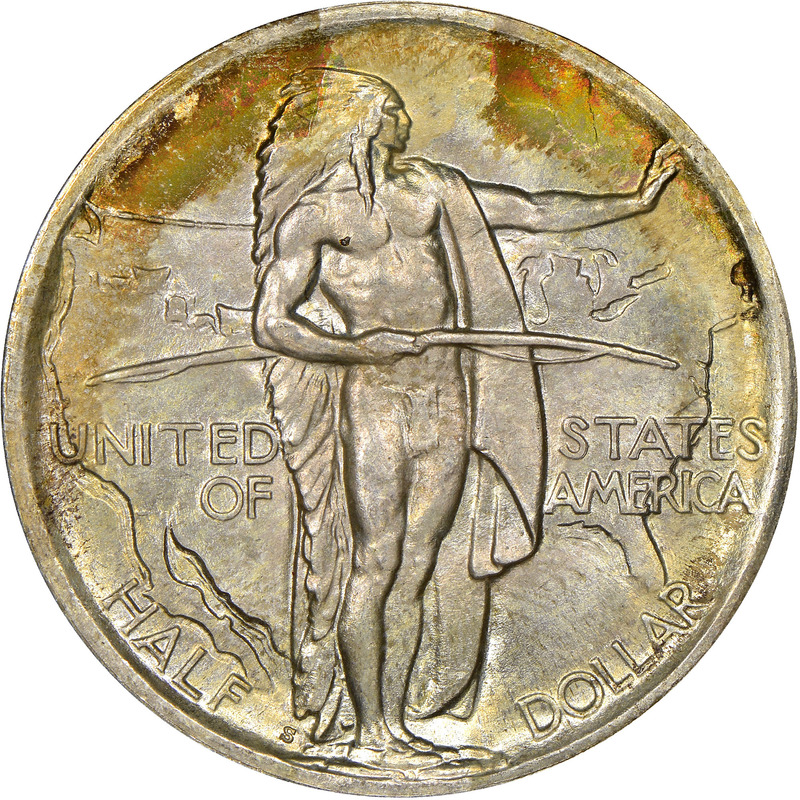 Once again, the Association was authorized to strike yet another issue, this one bearing the date 1933 and struck at the Denver Mint. The plan was to offer the mintage of 5,250 coins to visitors at the Century of Progress Exposition, at a cost of $2 each. These became an instant disaster and were sold mostly to speculators by the Scott Stamp and Coin Company of New York. 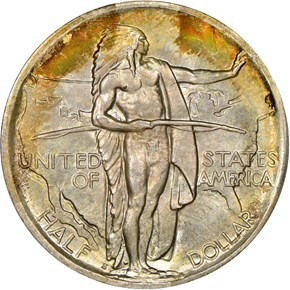 The Scott Company was also charged with liquidating the 1928 issues, but managed to sell only 6,000 coins. Ultimately, 44,000 of the 1928 coins went into the melting pot. 1934 saw the Denver Mint strike an additional 7,000 coins. This pattern was repeated in 1936 in Philadelphia (10,000) and San Francisco (5,000), again in 1937 in Denver (12,000), and finally with a three-piece set containing one coin from each of the three mints in 1938 (6,000) and 1939 (3,000). 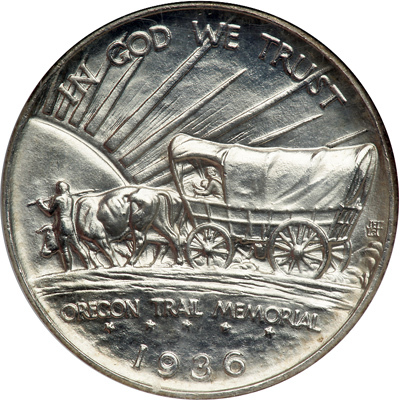 When the last Oregon Trail half was struck in 1939, its on-and-off, fourteen-year run had witnessed a total of only 264,419 coins minted, of which 61,317 were eventually melted, leaving a net mintage of just 202,928 pieces—less than 4% of the number originally authorized. The 1926 issues are by far the most common, while the 1939 issues are the most desirable, with mintages of only 3,000 from each mint.